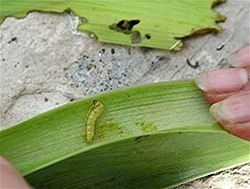 This damage is done by the pupae stage of a moth that lays its eggs in fall, usually on the leaves of your iris plants. The borers hatch in early spring, around the time that daffodils bloom. The pests tunnel down from the top of the leaves to the point where the leaves separate. Fortunately, there are steps you can take to prevent damage to your plants. The borers can eat their way into rhizomes about three weeks after blooming, eventually hollowing and destroying them. Cygon, a systemic insecticide used to be the pesticide of choice, but it is one of the chemical sprays taken off the market in 2002. 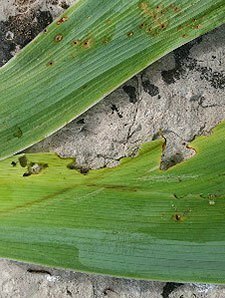 Fortunately, there are several measures gardeners can take to combat the borers and prevent damage to irises. First, apply dormant oil spray early in the season just as the leaves begin to grow. In early summer (June), look for notched leaves or damage where leaves separate. Trace chewing until you find borers; kill by squeezing, or remove and toss into soapy water. In fall, clean up all iris leaves and dispose of them in the garbage or by burning, not in compost pile (where eggs can overwinter). Nematodes are microscopic worms that live in the soil and feed off other soil life, including insect pests. They are starting to be more widely available from suppliers of organic controls and even local garden centers. The most promising nematode for the iris borer appears to be Steinernema carpocapsae (abbreviated to Sc). Several American studies have shown it to be an effective control. Nematodes work best in moist environments, so you need to apply them after it has rained, or after giving your iris patch a good deep watering. The time of year to apply them is just before the plants start to flower. Nematodes, being live organisms, are perishable. For best success, follow the package instructions to the letter.